We show you where your loads are, when they are going to arrive and alert you of any problems. 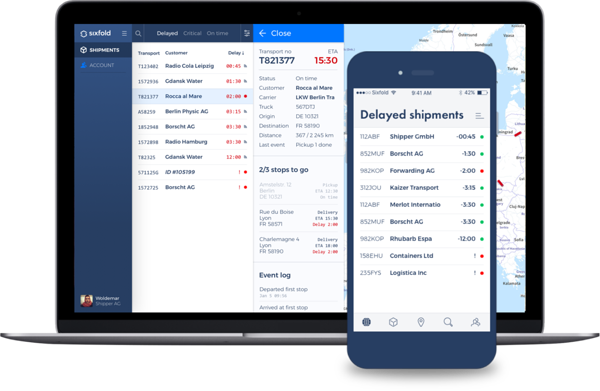 Sixfold keeps you continuously informed about real-time location, ETA, and status of your shipments, including potential delays or other problems that require your attention. This enables you to manage by exception, optimize your supply chain, and keep your own customers in the loop — with zero effort on your side. Contact us to learn more about shipper benefits. Sixfold helps you to reduce your cost by using visibility data to make check-calls redundant and providing services such as dynamic dock scheduling to reduce waiting times. All of that, while making your customers happy, by providing them with real-time transparency of their shipments — at your control. Contact us to learn more about carrier benefits. Becoming a Sixfold partner enables you to provide more value to your customers. They get additional access to their data and can easily share it with their customers. Our platform already works with leading telematics providers such as Fleetboard, Dynafleet, TomTom, and Scania. Joining is as easy as sharing your API with us. Contact us to join now. All modern trucks have Sixfold-compatible telematics systems installed. We track the connected trucks’ locations and store this info in our secure systems for analysis. 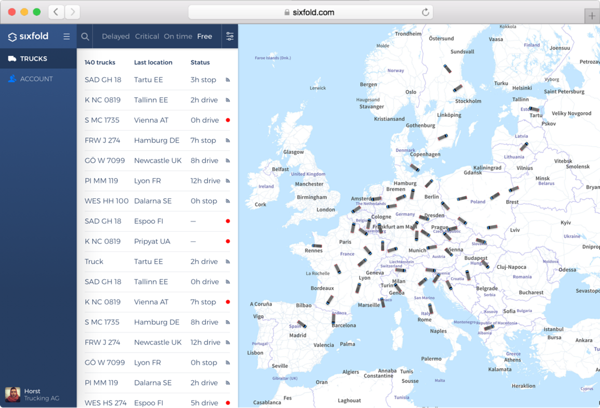 Sixfold combines the live telematics data with shipment information from shippers’ transport management systems. Thus, enabling us to track the respective truck. Sixfold makes location, ETA, and status of all shipments visible. Information on trucks that are not carrying a load or are driving for another shipper are limited to the carrier and said shipper. Sixfold is automated, allowing drivers, carriers, and shippers to focus on what matters most — making their customers happy. In case of predicted delays, Sixfold can notify any party you want.